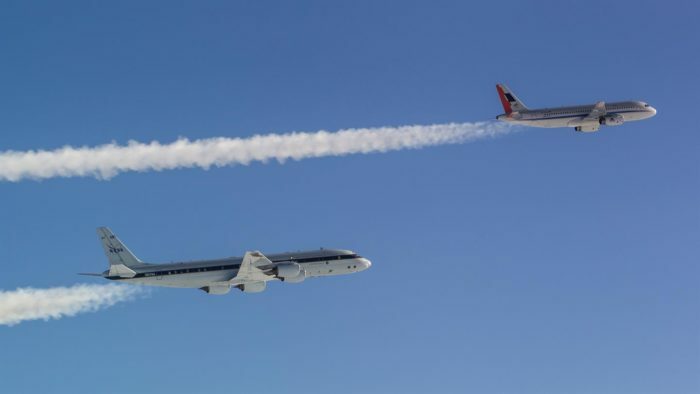 The EU Commission on Janaury 24, 2019 received the second European Aviation Environmental Report (EAER) of the European Aviation Safety Agency (EASA) in close collaboration with the European Environment Agency (EEA) and EUROCONTROL. The report provides a comprehensive overview of the environmental performance of the sector, and reveals that the solutions currently deployed at EU level are enabling improvements to the sustainability of aviation in Europe, namely in terms of noise per flight or fuel consumption per passenger. Between 2005 and 2017, carbon dioxide emissions increased by 16% and nitrogen oxide emissions went up 25%, That is because the number of passenger kilometres has skyrocketed in the same period, increasing by a massive 60%. Although the amount of noise pollution generated by individual flights is going down, thanks to advances in technology, the sheer number of planes in the air means that the number of people impacted by the phenomenon has increased 14% since 2014 alone. The target of the European Commission’s Flightpath 2050 commitment is to require sector-wide 75% reduction in CO2 emissions per passenger kilometre to support the Air Transport Action group (ATAG) target and a 90% reduction in NOx emissions. A number of airports have over the past years invested in hydrogen-powered ground support vehicles. Memphis International Airport in 2015 was the world’s first to deploy 10 (FedEx Express) fuel cell cargo tractors fleet thanks to funding from the US Energy Department’s Fuel Cell Technologies Office (FCTO) working to commercialise the use of fuel cell technology. More than twice as efficient as their diesel counterpart of 20% efficiency, the hydrogen cargo tractor has an efficiency of 45% and energy capacity of around 54 kWh (3.6 kg of H2). This allows the vehicles to run for 4 hours continuously at maximum haul capacity with liquid refuelling station just located in the airport ramp it takes approximately 3-4 minutes for refuelling. In 2014 Oslo Airport purchased its first hydrogen vehicle, and in 2015 announced plans to open its own hydrogen station for fuelling. “We want to facilitate use of zero-emission vehicles locally, in the ground transport service, and for external users,” said Oslo Airport environmental manager Tom Erling Moen. “Hyop” is Norway’s leading supplier of hydrogen fuel, with 5 hydrogen refueling stations in operation in the eastern part of Norway. Established in 2011, the company is dedicated to operating hydrogen refueling stations and production facilities. It is also a partner in the EU-project Hydrogen Mobility Europe, and will establish three next-generation stations as part of that project. Since 2015 Toulouse-Blagnac airport used 100% of its electricity from renewables energy supplies with its 3,633 solar panels on its car park roof. In 2018 the airport conducted two major energy transition projects initiated in 2017; HyPort launched jointly by Engie Cofely and the Occitanie Region in southern France to develop hydrogen power in the airport zone, and DEMETER project from Toulouse Metropole and Airbus to reduce carbon emissions from road congestion and modes of transport used by airport employees. The aim is to achieve carbon neutrality by 2020 within the Airport Carbon Accreditation program and create a so-called Hydrogen Region for Occitanie. The start-up budget of € 5 million, with the aims to test the use of a hydrogen production and distribution station that will supply projects on the tarmac and transport around the airport. This year however, hydrogen-powered electric vehicles will be deployed at Tarbes-Lourdes-Pyrénées airport. The Hyport project plans an investment of around €15 million with the creation of hydrogen production at the airport within a year and a half.